location, installation, maintenance history, and inspection history. It can be used along with iWorQ’s Work Management to maintain the life of your sidewalks by quantifying and prioritizing your sidewalk rehabilitation work. With iWorQ’s sidewalk management, users can keep a sidewalk inventory with detailed information such as the location, length, and type. It also can track each sidewalk’s segment faulting and cracking. The fields are customizable so you can change the field type and record information that is specific to your city or county. 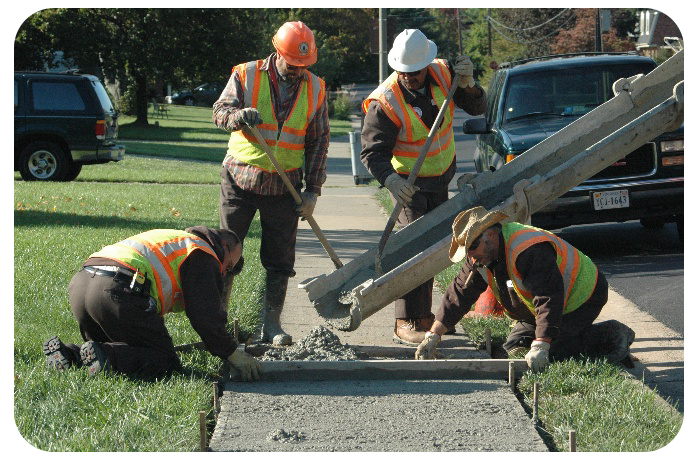 Enter in current rating information, such as cracking and faulting, to receive a recommended treatment to maintain the life of your sidewalks. Take notes, pictures, schedule maintenance, and enter ratings on the spot whether you’re out in the field or in the office. No downloading necessary, all you need is the internet. Access all past records for your sidewalks including inspections, maintenance, ratings, and treatments. iWorQ can use pavement or sidewalk information to create a layer to visually see your sidewalks. The layer is then linked to your sidewalk database so you can quickly edit information or enter in maintenance. Users can run reports on ratings, treatments, and general sidewalk information for making future decisions and budgeting. Reports can be exported into a different file type such as Excel. By using Work Management, you can calculate the costs of replacing specific areas of sidewalks or an entire sidewalk network.